The Eruptive Precursors project in Campi Flegrei, Italy, seeks to understand conditions leading to caldera eruptions. Calderas are the most hazardous type of volcano. These depressions in the Earth’s surface often form when a magma chamber empties suddenly after an explosive eruption. The hazard arises because of a caldera’s large size, the long-lived magma systems that feed large explosive eruptions, and an overlying hydrothermal system that can either mask or amplify magmatic processes and make it difficult to predict these eruptions. Periods of unrest, when the volcano undergoes abnormal changes in shape, structure, and chemistry, demonstrate calderas’ complexity. Unrest may culminate in an eruption, or it may merely mark a stage in a more complex dynamic evolution of the volcano. A conceptual model of the unrest may sharpen scientists’ understanding of the dynamics and lead to more reliable forecasts of impending eruptions. What can we learn about calderas by studying unrest? What should we expect from caldera unrest? What are the associated hazards? These were the central questions of the Eruptive Precursors project. After 2 years, this project has provided constraints on unrest, in the form of deviations from geophysical and geochemical baselines, at the Campi Flegrei caldera in southern Italy. Campi Flegrei is a restless caldera in a densely inhabited area; it lies immediately to the west of central Naples. After major eruptions 39,000 and 15,000 years ago, there was a marked uplift, which produced a resurgent dome, in the past 5000 years, during which several minor eruptions occurred (most recently in 1538). In the past century, at least three periods of unrest occurred, from 1950 to 1952, 1969 to 1972, and 1982 to 1984. This unrest led to the caldera’s surface rising as much as ~0.7, ~1.7, and ~1.8 meters, respectively (Figure 1). Fig. 1. (a) Simplified structural map of Campi Flegrei caldera (Italy), including the map view location of the magmatic source (green ellipse, 4 kilometers deep) and hydrothermal source (blue circle, 2 kilometers below the Solfatara volcanic crater) responsible for the post-1980 deformation [Amoruso et al., 2014]. (b) Elevation changes of benchmark 25a (shown in Figure 1a) from 1905 to 2009 [after Del Gaudio et al., 2010] merged with more recent (2009–2012) GPS data [De Martino et al., 2014]; m a.s.l. = meters above sea level. (c) Measured and simulated fumarolic carbon dioxide:water (CO2/H2O) ratio (top), ground deformation (middle), and earthquake magnitudes (bottom); dashed lines refer to times of injection of magmatic fluids into the hydrothermal aquifer [after Chiodini et al., 2012]. Credit: Acocella et al. . The best monitored and most dramatic unrest, which took place in 1982–1984, was accompanied by earthquakes of magnitude less than 4.2 on the Richter scale at a depth less than 3 to 4 kilometers and by surface fracturing. Campi Flegrei caldera then relaxed, and its surface subsided by almost 1 meter between 1984 and 2004. Since 2005, the caldera has been rising again, with a cumulative total of approximately 30 centimeters as of early 2015. This uplift has been accompanied by minor seismicity and a marked increase in the flux of the magmatic gases coming out of the volcanoes’ fumaroles [Chiodini et al., 2015]. The 2012–2015 Eruptive Precursors project (which has now ended) was launched to better understand the unrest behavior of Campi Flegrei and to assess the associated hazards. This project was a collaboration among the Italian Department of Civil Defense; the Napoli, Palermo, Pisa, and Bologna branches of the National Institute of Geophysics and Volcanology; and five Italian Universities (Roma Tre, Napoli, Perugia, Salerno, and Firenze). The project embraces geological, geochemical, geophysical, petrological, statistical, modeling, and hazard studies of the onshore and offshore portions of Campi Flegrei. The aim of the Eruptive Precursors project was to understand what happens within a restless caldera and what processes control unrest. Eruptive Precursors had three goals: to define how the shallow Campi Flegrei hydrothermal system works; to match this knowledge with that acquired about the caldera’s magmatic system, allowing scientists to propose a conceptual model of the restless Campi Flegrei caldera; and to evaluate magmatic and nonmagmatic hazards using a statistical technique known as a Bayesian event tree. The project was thus not directly aimed at defining the conditions causing an eruption at Campi Flegrei specifically, an objective still difficult to achieve. Rather, the aim was to understand what happens within a restless caldera and what processes control unrest. We produced a database of global caldera unrest from 1988 to 2014, which defines major types of unrest, including that at Campi Flegrei [Acocella et al., 2015]. We include statistical analyses of the unrest events. We incorporated the solubility of nitrogen gas in Campi Flegrei magmas into a model of volcano degassing. This helps connect measurements of the composition of the fumarolic gases to pressure variations controlling fluid-melt separation processes within the caldera [Caliro et al., 2014]. We highlighted the persistent activity of two sources (a magmatic reservoir at 4 kilometers depth, centered below Pozzuoli, and a hydrothermal reservoir at 2 kilometers depth, centered below Solfatara; Figure 1) to explain the surface deformation of the past 35 years. We also included a viscoelastic component of this deformation in our model [Amoruso et al., 2014]. We produced onshore and offshore monitoring data, including geophysical (infrared, GPS, tiltmeter, gravity, and seismicity) and geochemical (composition, fluxes and temperature of fumaroles, soils, thermal waters, and groundwater table) sources. We have organized many of these data and merged them into databases available to the scientific community [e.g., De Martino et al., 2014]. We produced a conceptual model that provides a first working hypothesis for the functioning and coupling of magmatic and hydrothermal systems. We produced a conceptual model that provides a first working hypothesis, shared with the scientific community, for the functioning and coupling of magmatic and hydrothermal systems. According to our model, the 4-kilometer-deep magmatic reservoir repeatedly releases magmatic gases into the shallower hydrothermal reservoir. 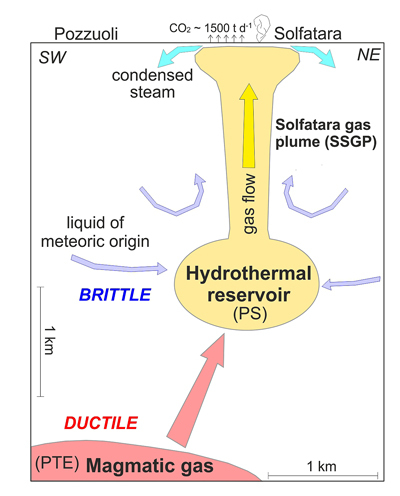 These gases interact with meteoric fluids (derived from precipitation), feeding the gas plume beneath Solfatara (Figure 2) [Chiodini et al., 2015]. This discontinuous but repeated discharge of magmatic fluids has depressurized the shallow magmatic system and heated the hydrothermal system by about 20°C to 100°C. The resulting changes in temperature and pressure suggest variations in the strength of the upper crustal rocks, raising concern about the specific risks and most likely locations for eruptions. This information will be included within the updated version of the Bayesian event tree for Campi Flegrei. We have also issued an elicitation (the first in 5 years) for experts to implement this model and use it to evaluate magmatic and nonmagmatic hazards. The current unrest phase at Campi Flegrei has lasted for 10 years. In contrast, the major unrest of 1982–1984 had shorter duration but was accompanied by intense seismicity and deformation. Fig. 2. Conceptual model depicting the release of magmatic fluids from the shallow magmatic source (red) toward the hydrothermal system (yellow) below the Solfatara volcanic crater, where these fluids mix with meteoric liquid (i.e., groundwater from rain; modified from Chiodini et al. , used with permission). PTE (pressurized finite triaxial ellipsoid) and PS (pressurized oblate spheroid) are the deformation sources active at Campi Flegrei at least since 1980 [Amoruso et al., 2014]. In this project we highlighted a possible reason for this difference. In addition to more recent (2012–2013) possible input of magma from the deep magma reservoir into the shallow thermal reservoir [D’Auria et al., 2015], the current unrest may have been driven largely by a relatively slow process that has heated the hydrothermal system. This process was a result of repeated events of fluid expulsion from a depressurizing magmatic source (Figure 2). Long-term heating may also promote persistent weakening below the caldera, creating more favorable conditions for a future eruption. Eruptive Precursors has provided a robust scientific basis to better understand the Campi Flegrei caldera, capturing the relationships between magmatic and hydrothermal systems. These processes may be representative of many similar restless calderas, including Long Valley (California), Yellowstone (Wyoming), and Rabaul (Papua New Guinea), thus providing an important reference for geologists studying calderas around the world. Our improved understanding of Campi Flegrei will be included in hazard assessment models, which will help scientists and government agency representatives mitigate the risks of the most dangerous volcanoes on Earth. Acocella, V., R. Di Lorenzo, C. Newhall, and R. Scandone (2015), An overview of recent (1988 to 2014) caldera unrest: Knowledge and perspectives, Rev. Geophys., 53, 896–955, doi:10.1002/2015RG000492. Amoruso, A., L. Crescentini, and I. Sabbetta (2014), Paired deformation sources of the Campi Flegrei caldera (Italy) required by recent (1980–2010) deformation history, J. Geophys. Res., 119, 858–879, doi:10.1002/2013JB010392. Caliro, S., G. Chiodini, and A. Paonita (2014), Geochemical evidences of magma dynamics at Campi Flegrei (Italy), Geochim. Cosmochim. Acta, 132, 1–15. Chiodini, G., S. Caliro, P. De Martino, R. Avino, and F. Gherardi (2012), Early signals of new volcanic unrest at Campi Flegrei caldera? Insights from geochemical data and physical simulations. Geology, 40, 943–946, doi:10.1130/G33251.1. Chiodini, G., J. Vandemeulebrouck, S. Caliro, L. D’Auria, P. De Martino, A. Mangiacapra, and Z. Petrillo (2015), Evidence of thermal-driven processes triggering the 2005–2014 unrest at Campi Flegrei caldera, Earth Planet. Sci. Lett., 414, 58–67, doi:10.1016/j.epsl.2015.01.012. D’Auria, L., et al. 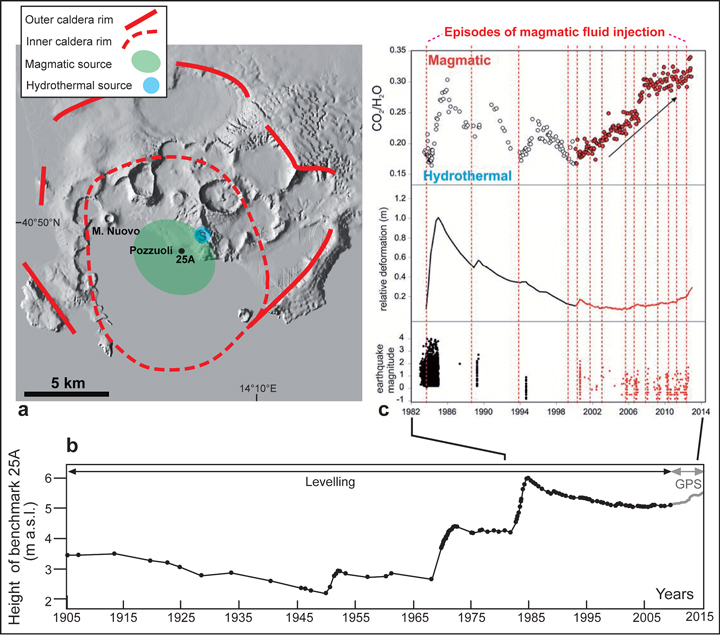 (2015), Magma injection beneath the urban area of Naples: A new mechanism for the 2012–2013 volcanic unrest at Campi Flegrei caldera, Sci. Rep., 5, 13100, doi:10.1038/srep13100. Del Gaudio, C., I. Aquino, G. P. Ricciardi, C. Ricco, and R. Scandone (2010), Unrest episodes at Campi Flegrei: A reconstruction of vertical ground movements during 1905–2009, J. Volcanol. Geotherm. Res., 195, 48–56, doi:10.1016/j.jvolgeores.2010.05.014. De Martino, P., U. Tammaro, and F. Obrizzo (2014), GPS time series at Campi Flegrei caldera (2000–2013), Ann. Geophys., 57(2), S0213, doi:10.4401/ag-6431. Citation: Acocella, V., and G. Chiodini (2015), Better forecasting for the next volcanic eruption, Eos, 96, doi:10.1029/2015EO039135. Published on 12 November 2015.